Sunday service extended from Cubitt Town to Poplar replacing withdrawn 56 on this day. Saturday service extended from Cubitt Town to Poplar replacing withdrawn 56 on this day and PR allocation added. Sunday service withdrawn between Angel and Smithfield. Clapton (CT) allocation converted from RTL to RT. Poplar (PR) allocation converted from RTL to RT. A small Sunday Poplar (PR) allocation added. Mon-Fri extended from Cubitt Town to Poplar making this a daily operation to replace Route 56 which was withdrawn. Daily extended in Poplar via East India Dock Road and Newby Place (returning via Poplar High Street) to POPLAR BATHS. 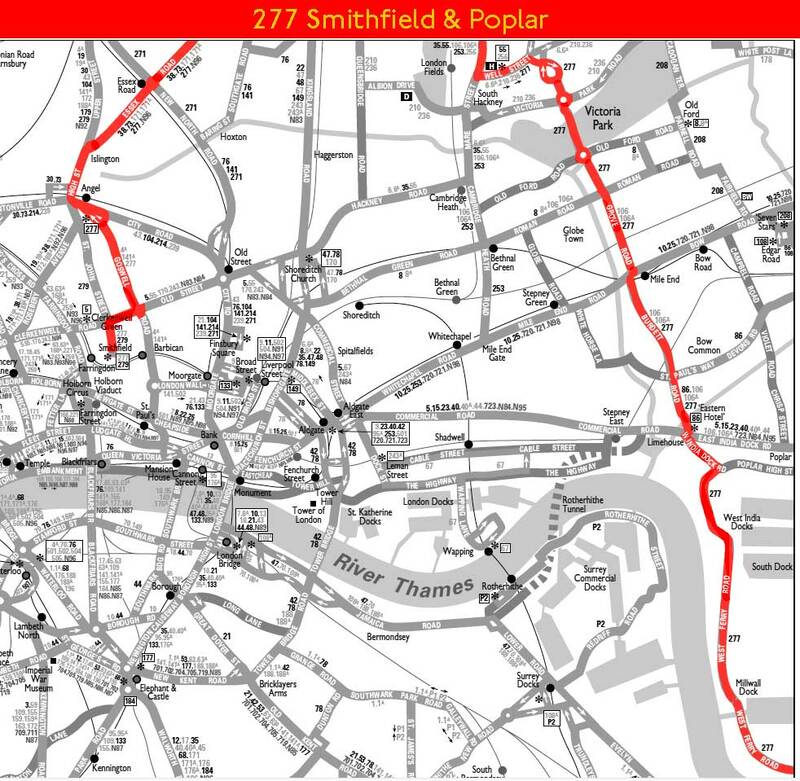 Converted to OPO and withdrawn between Cubitt Town and Poplar - this section covered by new crew route 277A . 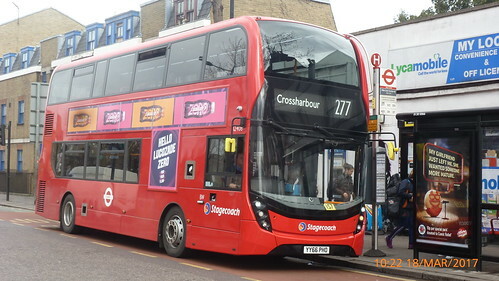 Extended from Cubitt Town to Poplar Baths replacing withdrawn 277A. Poplar (PR) allocation converted to Leyland Titan operation. Mon-Fri evenings withdrawn between Angel and Smithfield but extended on Sunday from Mildmay park to Angel. Clapton (CT) allocation converted to Leyland Titan operation. Clapton (CT) allocation converted from Leyland Titan to MCW Metrobus operation. Poplar (PR) allocation moved to Clapton (CT) with garage closure. Diverted at Canonbury via St Pauls Road to HIGHBURY AND ISLINGTON STATION - the Smithfield section replaced by new 56. Ash Grove allocation transferred to Bow (BW). MS extended CANARY WHARF Westferry Circus to Cartier Circle. Mon-Fri supplementary service between Canary Wharf and Mile End Station withdrawn along with West Ham (WH) allocation. Withdrawn between Canary Wharf and Poplar - this section replaced by introduction of Sunday service on Route D7. Mon-Sat extended from Canary Wharf to Leamouth. Sunday service extended from Canary Wharf to Leamouth as MS.
Allocation moved back to Bow (BW) - this was connected to Upton Park garage closure. Changeover at Well Street ? The Queen Hotel - Cubitt Town. My wife is a geordie and asked me to take her to the the real East End and so we bought a travelcard and visited a few pubs. I had bought some books earlier in the day and the alcohol must have dulled my mind as I left them under the stool at the "Queen". It was not until we got back to a pub in Bow (the Bow Bells) that I realised that I had forgotten my books and so I left my wife perched on a stool in the Bow Bells and returned to "The Queen" and asked the barmaid if anyone had handed in my books and she replied. "Anything else and I would say no - but books- no one can read round here - they will be where you left them - sure enough ! "